Whenever I go to Lacrosse I try to schedule my appointments so I can stop at the cute little shop in Hokah, Uncommonplace. The owner is so talented and a sweetie. The shop has a Facebook page. Debbie works hard to keep it and the shop fresh. You can find the shop Facebook page here. Any owl lovers out there? Here’s a whole collection. Many of the things Debbie makes herself. I love the coasters. Check out the cute dish towels with birds…and states…so cute! The shop is filled to the brim. Even though the shop is small…I could spend LOTS of time there. Debbie is a quilter and makes the quilts that are on display….a vintage machine lover too. I always snap Pyrex pictures when I see them as one time I wrote about Pyrex and a blog reader said she had no idea people are collecting it….they do. PROOF!! I only had a little time. There was no way to see it all. Here’s a little gem. I have one. There is a Christmas section. I adore the handmade ornaments. 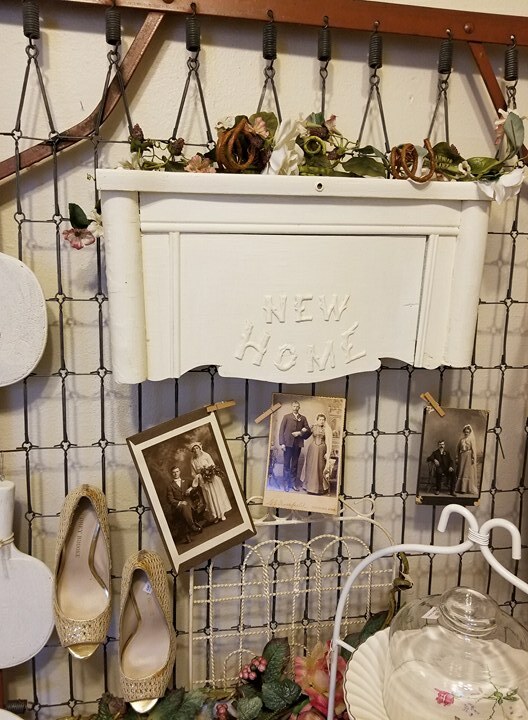 Check out how Deb used a ruined sewing cabinet. 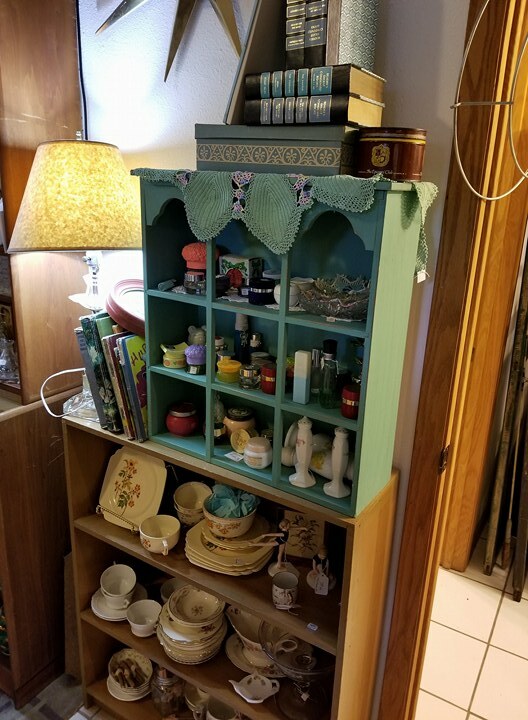 She cut off the front, painted it and turned it into a shelf. CUTE. The shop is full of color. Deb paints a lot of pieces. Something on this self caught my eye…any idea of what? THIS clock. Kayla has some vintage cross stitch things like it in her kitchen. Need an idea for something to do with old ties…Deb has the ideas. I just love going to the shop. This shelf. It’s not looking the best laid on the table. It will be much cuter hung. I also bought this knitting basket. I think this will get passed on to Kayla. I have a thing about buying these when I see them. Kelli, Kayla and I all like them. So that’s what I found that I couldn’t live without. Stop by sometime if you’re ever going through Hokah. It’s the cutest little shop. This entry was posted in Jo's Journal on April 17, 2018 by Jo. Thanks for the journey. I live in Florida so not likely I’ll get there but I sure enjoyed seeing everything. She probably has a great time creating for the shop! And hunting! I feel like a lazy bum when I look at all the things she makes! What a unique little shop – I can see why it’s so fun to visit! Loved the visit to Hokha…I live in Wales UK so probably won’t ever get there but HEY the web is wonderful. Have just finished a quilt for my sister ..your Rail Fence Jelly Roll . Her name is Jo and she was delighted to hear that I found the pattern at Jo’s Country Junction. Oh, Jo, that clock is really CROSS STITCH!!! How lovely! Your daughter will really enjoy it. I love her shop! 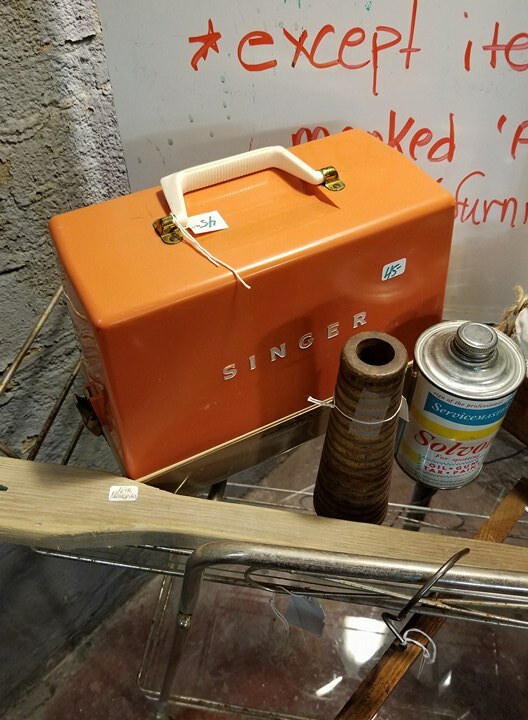 It is soooo full of great items. Thx for showing it to us!